As an Adsense publisher, I’ve often asked the question “what type of content has the highest earning potential?” I’m sure all publishers have asked this same question. Yet the answer has always been a bit elusive since there isn’t any solid Adsense data telling you outright what categories are more profitable as a publisher. Today, however, I found this chart from Business Insider that breaks down content categories by CPM – cost per thousand impression – and how much each category is paying per content source. 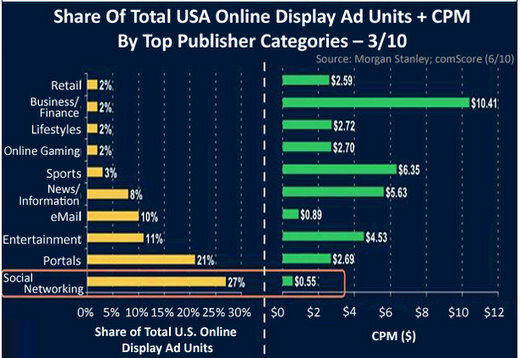 The purpose of the chart was actually to highlight how bad, or how “crummy” Facebook ad CPM was. But while doing so, they also revealed what the highest paying category which was “Business / Finance”. So finally, after years of exploring and utilizing Google Adsense, I think I may have found what I’ve always been looking for – the category that pays the highest CPM for online advertising. And if you look at the numbers, Business / Finance is nearly double CPM than any other category!